Cloud Computing refers to storing and accessing you data over the internet instead of your own system. 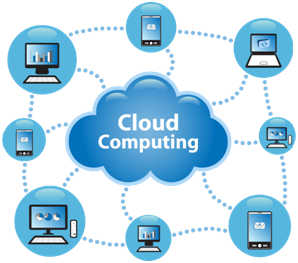 In Cloud computingÂ large groups of remote servers areÂ connectedÂ to allow centralized data storage and online access to data. Cloud Computing removes pressure from the one system which handles all the software, instead it is handled by the networks of the computers that make up the cloud. We all have used Cloud Computing in a way or another. Gmail, Hotmail and other web based services are the perfect example of Cloud Computing as by using them we do not run the e-mail program on our system instead we log in to a web based e-mail account remotely. The details of our account and the data on the email is not stored on our PC but on the serviceâs computer cloud so that any one from any place can access it whenever he/she wants. Unlimited Storage: While using a PC, the fear of storage is always there. Systemâs storage can run out at any time but when we talk about Cloud Computing the case is not same. Cloud Computing offers almost unlimited storage depending on the money you are paying for it.